Blogging Lawyers: Are You Maximizing Your Google+/Authorship Presence? – Web Presence Esq. If you are a regular reader of our blog, or follow us on Twitter or LinkedIn or Facebook or Google+, you know just how important Google+ and Google Authorship is for lawyers looking to increase their online presence. One of the perks of Google Authorship is the avatar (i.e. your headshot) that shows up next to links associated with your Google account, which means instant facial recognition, increased search engine rankings, more clicks, and on and on… But if you have Googled yourself lately, you may have noticed that your Google+ photo (and other identifying information) has disappeared from the search results. 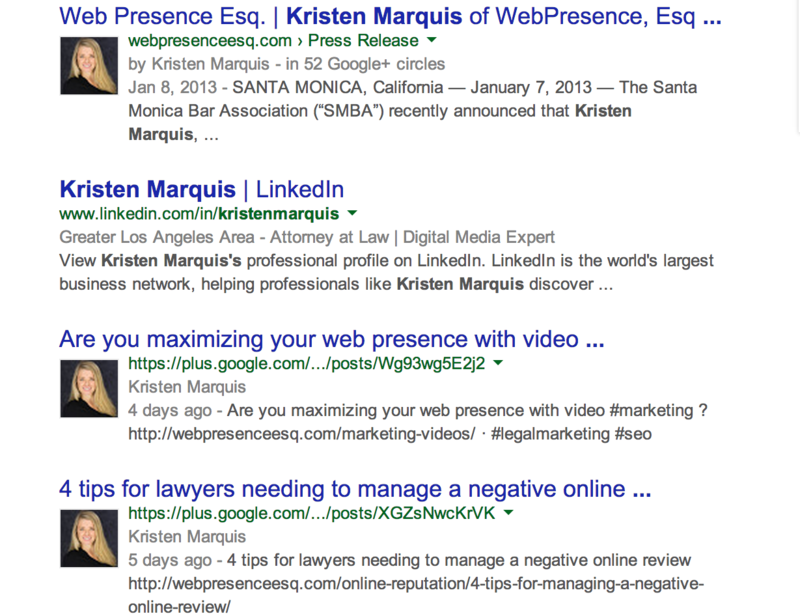 A quick Google search of “Kristen Marquis” (Founder of WebPresence, Esq.) shows several links with her avatar (i.e. headshot). 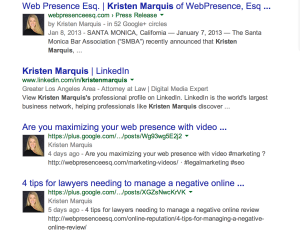 A quick Google search of “Kristen Marquis” (Attorney & Founder of WebPresence, Esq.) shows several links with her avatar (i.e. headshot). So what’s happening? Read on to learn how to regain your powerful online presence. Not surprisingly, the higher the content quality, the more likely snippets will show up in search results. So what can you do to see your avatar more frequently? Create relevant and valuable content. Just when you thought we couldn’t say it again… Here it is: Google prefers (and rewards) quality legal content. When you blog, discuss your practice areas in an in-depth, accurate, and helpful way. Publish that content correctly. Use keywords that will draw your target audience to your website. And write articles for well-respected publications that will get attention (talk to us about PR). Share it across as many networks as possible. When you write a new blog post, share it on your social networks. Social media optimization is a powerful link-building tool! While Google continues to change its search algorithms in order to provide the best user-experience, and deliver the most relevant results, one thing remains: Good content adds to your authority and increases your online presence. For more information about creating a strong legal blogging campaign, or to discuss increasing your online presence and attracting the new business you want, contact the expert legal marketers at WebPresence, Esq. today.